Discover Ticket To Ride, the digital adaptation of the famous Ticket To Ride board game. Don't hang about on the platform – board the train and set off on a railway adventure like no other. Collect wagons to take control of the railways connecting the various cities of the United States of America and relive the golden age of the first railroads. Continue the adventure in other countries using the various maps available in the store, including Europe, India, Asia, Germany, and the new United Kingdom expansion. Now you can create your own railway network by connecting cities across the world. Enjoy different gaming experiences such as challenging players from around the world in asynchronous multiplayer mode and discovering a very balanced single-player mode on different platforms! 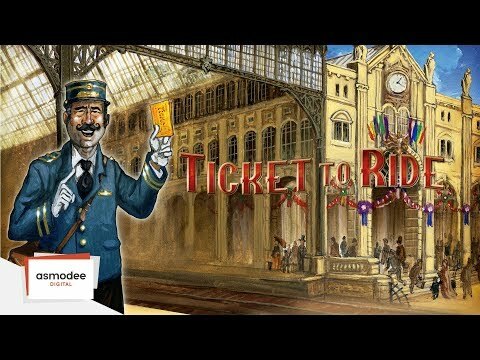 With over 50 million online matches and a new game starting every four seconds, Ticket To Ride delivers a gaming experience that is unique in its genre. **Ars Technica – ""Ticket to Ride is impressive right from the start""
**Pocket Gamer: 9/10 with a Gold Award – ""A fantastic adaptation of an excellent board game, and a must-buy for strategy fans""
• The original USA board from Alan R. Moon's Ticket To Ride in high resolution. · ...And new content updated regularly! • Single-player mode: play against 1 to 4 AI opponents. · Asynchronous online games (Wi-Fi, 3G and 4G) against other players on all types of smartphones and tablets, as well as on computers. · A unique online community with tens of thousands of players available 24 hours a day! · Pass and Play Mode: up to 5 players on one screen and the option of adding AI (bots). • Tutorial to quickly familiarize you with the game. • Pop-up help during the game to help you get to know all the subtleties of the various boards and game rules. • Ranking of the best online and single-player players (best scores). Languages available: English, French, German, Spanish, and Italian. download new version. then I cannot open this app. 起動エラー I solved by a factory reset.Thank you for your quick response.